I have been obsessing with Vietnamese food lately. I just love all the flavors and the heat it brings to the table. Since its been pretty cold here in Philadelphia I wanted to make some Pho soup. Now I know the traditional way of making this soup takes a couple of hours. But I have 2 little ones running around and sometimes I just don’t have the time to sit there and prepare something from scratch (although I love doing that). Anyway I hope you try this delicious dish, you will not be disappointed. In a Dutch oven pot on medium heat, drizzle olive oil. Then add anise seeds, cinnamon stick, garlic and stir for about 1 minute. Then add broth. Simmer for about 4 to 5 minutes then add green onions. Bring a 6qt pot of water to a boil and cook Udon noodles (should take about 12 to 15 minutes to cook.) Place in cold water afterwards. 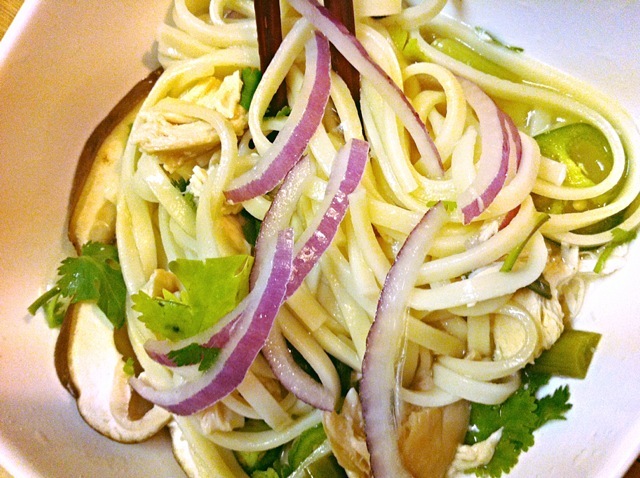 Take a large bowl add the noodles, chicken broth and top with chicken, mushrooms, purple onions, jalapeno, Serrano and some cilantro. Enjoy!! such a good post title. i’m impressed.